The roofing underlying materials market is highly fragmented as the top five players accounted for a combined share of 13.5% of the overall market in 2015, finds Transparency Market Research (TMR). Some of the major companies operating in the market are Braas Monier Building Group, CertainTeed Corporation, Carlisle Companies, TAMKO Building Products, Inc., Firestone Building Products Company, IKO Industries Ltd., Owens Corning, and DuPont. The cheap availability of raw materials and relatively modest initial investment, coupled with a burgeoning global construction industry, have lowered the barrier to entry for small and medium scale players. Top players are actively focusing on product innovations and constantly diversifying their product portfolio to gain a competitive edge over others. Companies are also investing substantial amounts in research and development activities, especially in emerging markets. 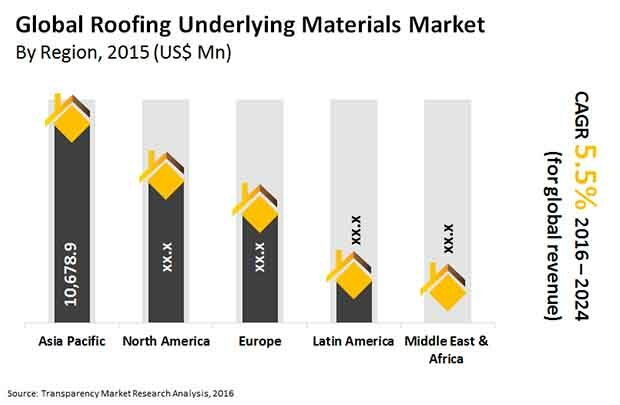 The global roofing underlying materials market stood at US$27.99 bn in 2015. Rising at a CAGR of 5.5% from 2016 to 2024, the opportunities in the market are anticipated to surge to US$45.16 bn by the end of the forecast period. Geographically, the global market for roofing underlying materials is segmented into Asia Pacific, North America, Europe, the Middle East and Africa (MEA), and Latin America. Of these, the Asia Pacific and Latin America markets are expected to exhibit impressive growth over the forecast period. On the other hand, North America and Europe are expected to witness a slowdown. A growing number of refurbishing and maintenance activities are providing a sweet spot for market players in these developed regional markets. The major application segments of the roofing underlying materials market are residential, commercial, and non-commercial. Of these, the residential sector is expected to register a significant CAGR of 6.0% during 2016–2024, in revenue terms. The growing number of residential construction projects in various countries such as China, Costa Rica, Malaysia, and India is a key factor boosting the segment. This is mainly attributed to the swift pace of industrialization and rapid urbanization in various parts of the countries in developing regions. The roofing underlying materials market is mainly driven by the sustained and substantial demand for roofing materials from the construction industry in various regions, particularly in emerging markets. The rapidly expanding populations in regions such as Asia Pacific, Latin America, and several countries of MEA has led to the construction of private and public infrastructures across all sectors. The rapid pace of urbanization has spurred the construction of residential buildings, which is fuelling the roofing underlying materials market. However, the rising cost associated with making bituminous roofing, mainly attributed to volatility in cost of asphalt, is expected to hinder the roofing underlying materials market to an extent. The constant availability of good quality asphalt is a key concern for manufacturers of bituminous roofing underlying materials. The availability of cheap substitutes will stimulate many manufacturers in the building and construction industry in developing markets, negatively impacting the overall market. Nevertheless, the demand for advanced roofing construction materials that are energy efficient has propelled the demand for eco-friendly materials, thereby boosting the market. Furthermore, recent advancements in solar roofing technology have opened up exciting opportunities for market players. In addition, the growing popularity of non-bitumen synthetic roofing is expected to open up lucrative growth avenues for market players across various regions.